If Call of Duty and Assassin's Creed can make big money with yearly installments, so can Final Fantasy, says Square Enix. Back in the day, a new Final Fantasy game was a rare thing. Fans eagerly anticipated each new installment, and politely waited until after the game had come out to proclaim their undying hatred for it on the internet. However, between sequels, remakes, and the occasional flagship title, the market has been somewhat glutted with Final Fantasies lately. In spite of this, series fans may want to prepare for an even more aggressive release schedule: Square Enix wants to take inspiration from bestselling Western game series and release a new title every year. "I think we took a little too long getting [Final Fantasy XIII] out," says Yoshinori Kitase, a developer and producer of the upcoming Final Fantasy XIII-2. "When you think of Western triple A titles like Call of Duty, Battlefield, and Assassin's Creed, they seem to work with a lot shorter turnaround - they make a new game in 1-2 years. That is something we need to follow up, because that seems to be the best way to keep our fans interested and attracted to the franchise." Kitase explains that this paradigm led Square Enix to develop and release Final Fantasy XIII-2 in the space of eighteen months. While it's true that yearly installments in ongoing series can help keep fans hooked, they have varying degrees of success. While Call of Duty broke sales records for every entertainment medium in existence, Ubisoft braced itself for a steep decline in sales for Assassin's Creed: Revelations. Furthermore, if gaming forums are any indication, Final Fantasy XIII did not sit well with fans primarily due to a poorly paced story and ultra-linear level design, not its development time. 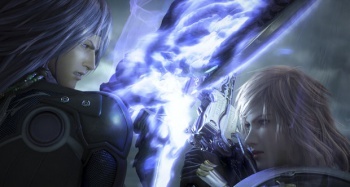 Final Fantasy XIII-2 looks fine, but will probably not win over many new fans for the series. Releasing a new Final Fantasy title every year could prove lucrative in the short-term, but what do Final Fantasy fans really want: consistency or innovation? Within a few years, the sales figures will tell.